Product prices and availability are accurate as of 2019-04-14 03:49:51 BST and are subject to change. Any price and availability information displayed on http://www.amazon.co.uk/ at the time of purchase will apply to the purchase of this product. 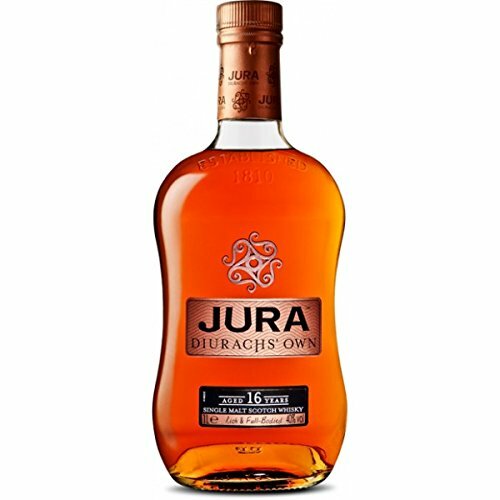 This 16 year old from the Isle of Jura was a bronze medal winner at the 2004 International Wine and Spirits Competition. With the smoothness of the 10 year-old allied to extra complexity from more ageing, this is a winner. 'A delicious and sophisticated dram with impressive depth and almost perfect weight. 70cl Glass Bottle ABV: 55.8% Scotch Malt Whisky from the Island Regions of Scotland Savour it neat, on ice, with a mixer or in a cocktail. It is an offence for any person under 18 years to buy or attempt to buy alcohol. Please drink responsibly.